Like a cosmic lava lamp, a large section of Pluto's icy surface is being constantly renewed by a process called convection that replaces older surface ices with fresher material. 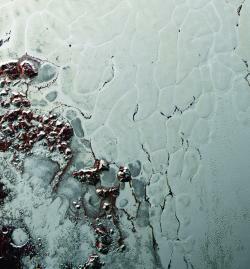 Combining computer models with topographic and compositional data gathered by NASA's New Horizons spacecraft last summer, New Horizons team members have determined the depth of this layer of solid nitrogen ice within Pluto's distinctive "heart" feature – a large plain informally known as Sputnik Planum – and how fast that ice is flowing. The study is published in the June 2 issue of the journal Nature. Mission scientists used state-of-the-art computer simulations to show that the surface of Sputnik Planum is covered with icy, churning, convective "cells" 10 to 30 miles (16 to 48 kilometers) across, and less than one million years old. The findings offer additional insight into the unusual and highly active geology on Pluto and, perhaps, other bodies like it on the outskirts of the solar system. "For the first time, we can really determine what these strange welts of the icy surface of Pluto really are," said William B. McKinnon, from Washington University in St. Louis, and the co-investigator on the New Horizons science team who led the study. "We found evidence that even on a distant cold planet billions of miles from Earth, there is sufficient energy for vigorous geological activity, as long as you have 'the right stuff,' meaning something as soft and pliable as solid nitrogen." McKinnon and colleagues believe the pattern of these cells stems from the slow thermal convection of the nitrogen-dominated ices that fill Sputnik Planum. A reservoir that's likely several miles deep in some places, the solid nitrogen is warmed by Pluto's modest internal heat, becomes buoyant and rises up in great blobs – like a lava lamp – before cooling off and sinking again to renew the cycle. The computer models show that ice need only be a few miles deep for this process to occur, and that the convection cells are very broad. The models also show that these blobs of overturning solid nitrogen can slowly evolve and merge over millions of years. Ridges that mark where cooled nitrogen ice sinks back down can be pinched off and abandoned, resulting in Y- or X-shaped features in junctions where three or four convection cells once met. "Sputnik Planum is one of the most amazing geological discoveries in 50-plus years of planetary exploration, and the finding by McKinnon and others on our science team that this vast area—bigger than Texas and Oklahoma combined – is created by current day ice convection is among the most spectacular of the New Horizons mission," said New Horizons Principal Investigator Alan Stern, of the Southwest Research Institute, Boulder, Colorado. These convective surface motions average only a few centimeters a year – about as fast as your fingernails grow – which means cells recycle their surfaces every 500,000 years or so. While slow on human clocks, it's a fast clip on geological timescales. "This activity probably helps support Pluto's atmosphere by continually refreshing the surface of 'the heart,'" McKinnon said. "It wouldn't surprise us to see this process on other dwarf planets in the Kuiper Belt. Hopefully, we'll get a chance to find out someday with future exploration missions there." New Horizons could also potentially take a close-up look at a smaller, more ancient object much farther out in the Kuiper Belt – the disk-shaped region beyond the orbit of Neptune believed to contain comets, asteroids and other small, icy bodies. New Horizons flew through the Pluto system on July 14, 2015, making the first close observations of Pluto and its family of five moons. The spacecraft is on course for an ultra-close flyby of another Kuiper Belt object, 2014 MU69, on Jan. 1, 2019, pending NASA approval of funding for an extended mission. New Horizons is part of NASA's New Frontiers Program, managed by the agency's Marshall Space Flight Center in Huntsville, Alabama. The Johns Hopkins Applied Physics Laboratory designed, built, and operates the New Horizons spacecraft and manages the mission for NASA's Science Mission Directorate. The Southwest Research Institute leads the science mission, payload operations, and encounter science planning.